Did you ever wonder how you can help make a difference at some of Buffalo’s incredible historic and heritage churches? Buffalo Mass Mob has an easy answer! 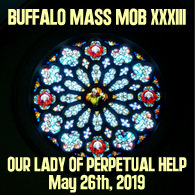 Inspired by the successful Buffalo Cash Mob and a Facebook Mass done at Saint Adalbert Basilica a couple of years ago, Buffalo Mass Mob will, in grassroots fashion, allow you to support and experience some of Buffalo’s wonderful churches in need of a boost. The concept is simple. The Buffalo Mass Mob picks a church and you come. Our city is known for its incredible architecture. Part of this architectural mix are the many churches located throughout Buffalo. These houses of worship helped shape and define the city as we know it. It is Buffalo Mass Mob’s hope to help create more awareness and appreciation for sacred sites in Western New York through the simple act of experiencing them in their intended purpose and encourage people to attend Buffalo’s historic and heritage churches. It is an easy way for you to support the wonderful churches we have here in Buffalo. Enter your email address to follow this Buffalo Mass Mob and receive notifications of new posts by email.